JGPS.me is a location service for posting your location from your mobile device. This service has privacy features such that sharing of your location is revoked automatically after an elapse of time and sharing your location does not require indicating relationships with others. As an examle, you could use this serivce to share your location with some party while you're on the way to their house. These persons would not need to log in or indicate any association with you. Once you arrive, you can simply forget about sharing your location and allow the authorization to expire automatically. So far, there is only one working client and it has been abandoned. JSON Location Tracker is a client for WebOS. It actually came before JGPS.me. It has been abandoned because there's no living platform for it. Although, supposedly HP is still backing the platform even though there's no devices for it. [alpha] Web Tracking This is a new web-app based client right here on the site. It has only been tested with Android, but it seems to function semi-reliably. The communications protocol is JSON based. JSON clients exist for nearly every modern programming language, so you may interact with this site in any way that you wish. 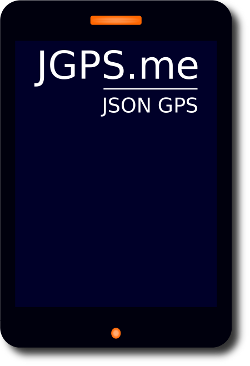 The JSON-gps protocol is enumerated in detail on the protocol page. This website is hosted on Google App Engine. It will remain free (as in free beer) as long as it is affordable and reasonable to provide the service for free. It is expected that eventually there will be a premium tier. Please flattr this site, it might help to keep it free.